Time poor, flavour rich. 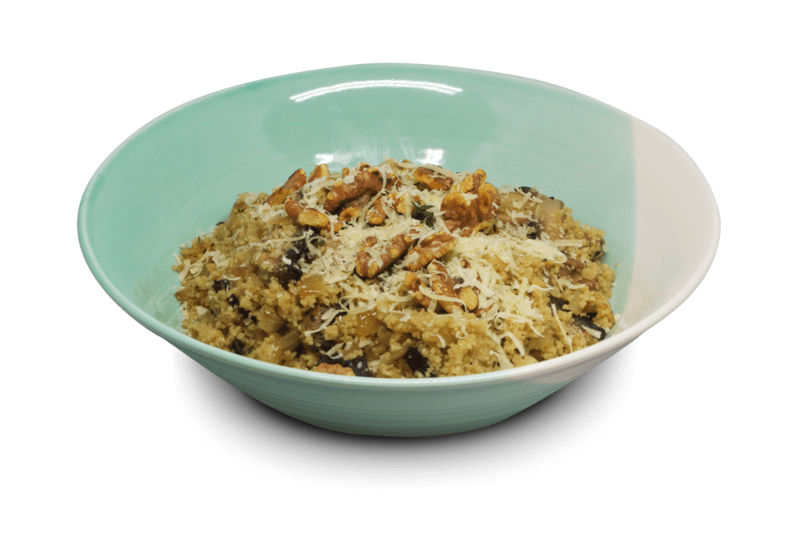 A super simple and easy risotto substitute that delivers a smooth and umami punch, packed full of mushrooms, cheese and creamy couscous. Step 1 Add some oil to a frypan on medium heat, when hot add garlic and onion. Cook for 5 mins or until onions are translucent. Step 2 Chop up your mushrooms in about 1 inch pieces, when onion and garlic is cooked, add in the mushrooms. Cook everything for about 10 mins or until garlic is cooked down and browned. Step 3 While mushrooms are cooking, remove thyme leaves from their stem and add to mushrooms. Step 5 When couscous is absorbed, turn off the heat and add your knob of butter. Stir through until melted and incorporated, and serve! Step 6 Serve into bowls, add shaved or grated parmesan, some crushed gently pan toasted walnuts on top, extra thyme and freshly cracked pepper. Voila!